Many combinations of family relations have topped the UK singles chart. There have been brothers and/or sisters in groups, brothers and sisters separately, fathers and sons, fathers and daughters, husbands and wives but only once has there been a mother and son combination and that happened in 1972 when Lieutenant Pigeon topped the chart with Mouldy Old Dough. The story began as early as 1963 when the pianist and singer, Rob Woodward, recorded first under the name of Shel Naylor and released two singles, How Deep Is the Ocean and the follow up, One Fine Day which was written by Dave Davies from The Kinks. With his friend, the drummer Nigel Fletcher, he converted his mother’s front room into a makeshift recording studio and once they brought in Stephen Johnson on bass, they became Stavely Makepeace and recorded for Pyramid Records. They released a number of singles with some interesting titles, (I Want To Love You Like A) Mad Dog, Tarzan Harvey and Smokey Mountain Rhythm Revue to name three and appeared on a number of television shows including The Old Grey Whistle Test, but for some reason BBC radio failed to include any of their tracks on the playlist and subsequently none of their songs became hit singles. It was time for a re-think to decide where to go from there! Nigel decided to take up the offer of some studio work in Erie in Pennsylvania and left for the States in April, the rest of the band took temporary work deputising with other bands and a break from Stavely Makepeace seemed a good idea! In the interim they embarked on a side project and recorded a couple of tracks. As an additional gimmick they introduced Rob’s piano teacher mother Hilda who looked a little similar to Mrs Mills to the line-up. Rob also played piano so in fact the group featured two pianists. They had an idea for an instrumental which they called Mouldy Old Dough and only featured the unspeakable rough vocals of Nigel Fletcher growling the title and sounding something that had been lifted from a 1950s horror movie. The title comes from the twenties phrase, Vo-Do-De-O, a nonsensical phrase used in dance records of that period. The Savoy Orpheans recorded Vo-Do-De-O Blues in 1927, and you can hear variations on Marilyn Monroe’s I Wanna Be Loved by You and on some Temperance Seven records. 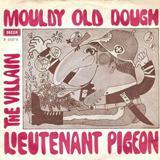 Mouldy Old Dough was recorded in the winter of 1971 and released by Decca records who named the band Lieutenant Pigeon. In an interview with New Musical Express Nigel Fletcher explained what it was like, “Hilda’s front room in Coventry was the scene of the crime. We didn’t use the best equipment – it was recorded on a domestic machine. We find we get a better sound using the front room.” That front room was of great interest to the ATV television company in the Midlands who decided to feature it on one of their current affair programmes and sent a young new reporter round to tell the story, that reporter was Chris Tarrant! The song initially made no impact in the UK but unbeknown to anyone in the band the song was being used every weekday evening to introduce a Belgian nationwide news and current affairs TV programme and had been since the spring! By the summer thousands of people had written in enquiring about the theme music. When the TV station announced that it was available as a single, sales began to rocket! In July 1972 Nigel returned to Britain and the record was number one in Belgium. In fact it was purely coincidental that a telegram from Decca Records to this effect arrived at the same time that Nigel arrived home! The song eventually entered the UK chart in September of 1972 and just four weeks later it went to number one here too. In doing so it make Hilda, who at the time was 59, the oldest female to ever appear on a number one hit and that record still stands today. She wasn’t the oldest female to make her debut though, that honour goes to Hylda Baker who, in 1978, when she accompanied Arthur Mullard on a disastrous cover of You’re The One That I Want, was 73. In December 1972, they followed it up with Desperate Dan which peaked at number 17, but Rob will have the satisfaction of knowing that not only did Mouldy Old Dough became the second biggest selling single of the year after The Royal Scots Dragoon Guards’ rendition of Amazing Grace, but it earned Rob and Nigel the Ivor Novello songwriting award for 1972! Their next single, And the Fun Goes On, bombed but surprisingly they made three albums and even had an Australian number one with a revival of I’ll Take You Home Again Kathleen from their album, Pigeon Party. The novelty of having a now-60 year old ‘mum’ in the line-up attracted much publicity and the band went from strength to strength and Hilda was quite prepared to go out on the road but the lads, knowing what it would entail, managed to talk her out of it. Despite this Lieutenant Pigeon did several overseas mini tours and also appeared live in Britain at various small venues. The very last time the original four members played together was in Luxembourg in September 1978 and around the same time Rob and Nigel decided to launch their own Comet record label. Hilda died in February 1999 at the age of 85, Steve reformed the band for oldies shows in 1992 and is the only original member. Nigel and Rob are still in the business and now concentrate on creating new songs and make occasionally appearance on BBC Coventry and Warwickshire with the Irish DJ Bob Brolly. Three interesting facts: one is the week Mouldy Old Dough hit the top spot in the UK, Chuck Berry did likewise in the US with My Ding-A-Ling which meant that both singles on either side of the Atlantic had been recorded in Coventry as the latter was recorded live at The Locarno in Coventry City Centre. The second is on the 1972 Christmas edition of Top of the Pops instead of raucously singing Mouldy Old Dough, Nigel sings dirty ole man, and the third is that the Rolling Stones drummer Charlie Watts called his racehorse, Mouldy Old Dough.